We love activities that bring families together. After hearing about the new Jim Henson movie premiering tonight on Lifetime, we felt inspired to create our own puppets! Turkey Hollow was written in 1968 but never released until today. It features a bunch of Henson’s lovable puppets and an awesome family-friendly storyline. 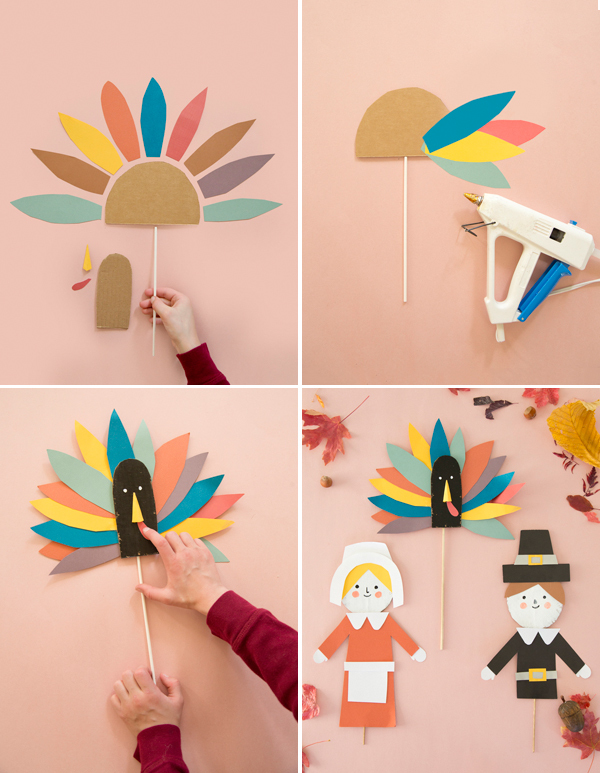 Before or after watching it with your kids, you can easily create Thanksgiving puppets out of supplies you have at home. 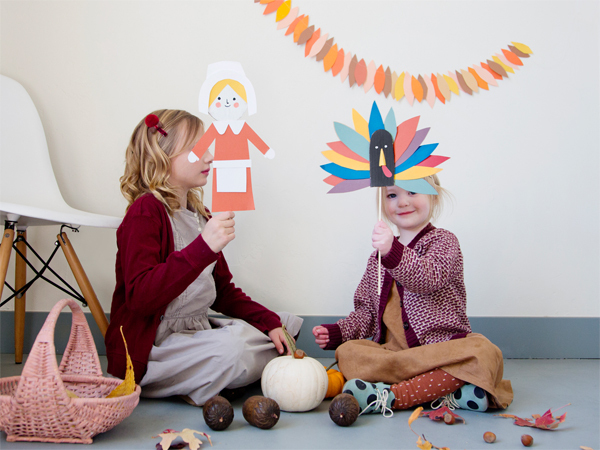 Our friend Merrilee helped us come up with the concept for these little pilgrims and turkeys. 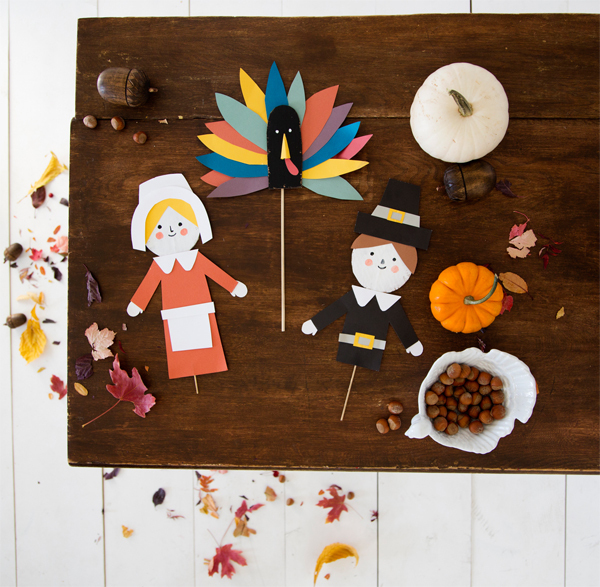 Use them to act out Thanksgiving adventures with your family throughout the next week. And make sure you tune in tonight, Saturday, November 21 at 8pm ET/PT, to watch Jim Henson’s puppets starring in Turkey Hollow! Step 1: Print templates onto card stock. Cut out. Step 2: Trace templates onto colored paper for pilgrims clothing and hat. Cut out. Step 3: Cut out head from cardboard. Step 4: Paint face onto cardboard (make sure the corrugation is going up and down) and let dry. 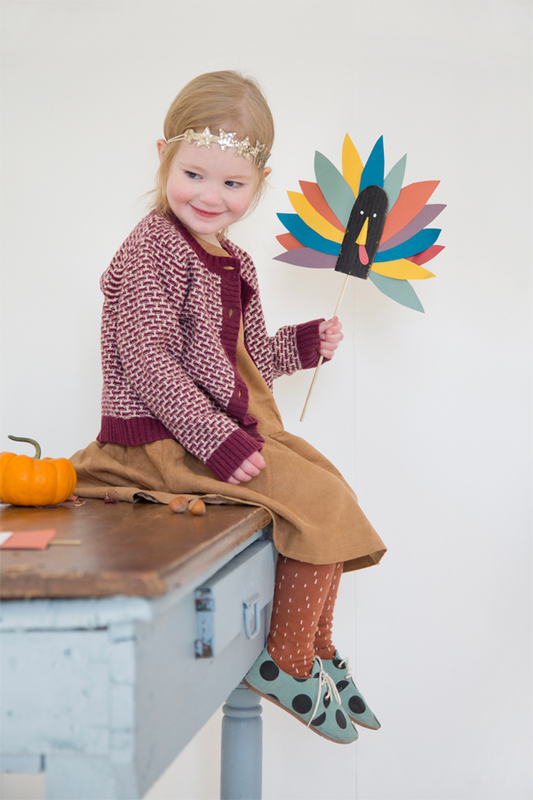 Attached hair and assemble clothing and hat with adhesive (glue or tape runner). Step 5: Insert skewer into head. Glue hat to head. Step 6: Turn over. using a large strong piece of tape, adhere the pilgrim’s clothing to the back of the skewer stick. 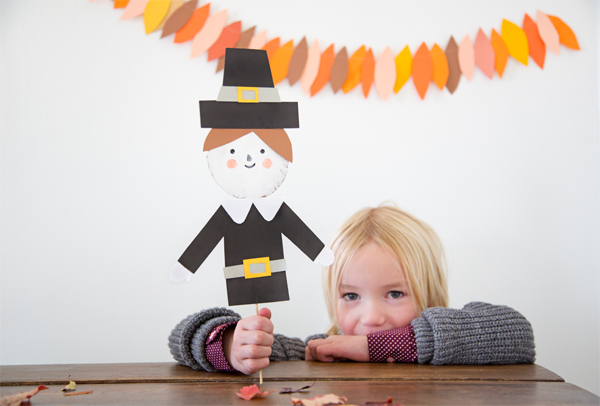 Step 7: Turn over and now your pilgrim puppet is ready to play! Step 2: Trace templates onto colored paper for pilgrim girl’s clothing and bonnet. Cut out. Step 4: Paint face onto cardboard (make sure the corrugation is going up and down) and let dry. Attached hair and assemble clothing and bonnet with adhesive (glue or tape runner). Step 5: Insert skewer into head. Step 6: Turn over. Using a large strong piece of tape, adhere the pilgrim’s clothing to the back of the skewer. 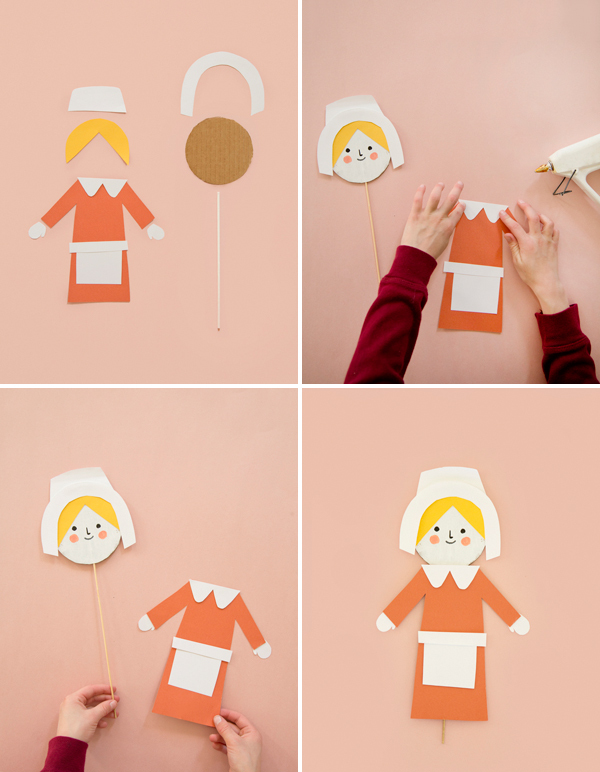 Step 7: Turn over and now your pilgrim girl puppet is ready to play! Step 2: Trace templates onto different colored paper for turkey feathers. Step 3: Cut out turkey head from cardboard. Paint and let dry. Step 4: Paint two eyes onto turkey head. Step 6: Glue turkey feathers onto body being sure to start near the center of the body. Continue gluing feathers around the the rest of the body. Step 7: Glue turkey head onto feathers and body piece. Step 8: Insert skewer into body. glue in place if you wish. Step 9: Hold and glue on the beak and then the gizzard. 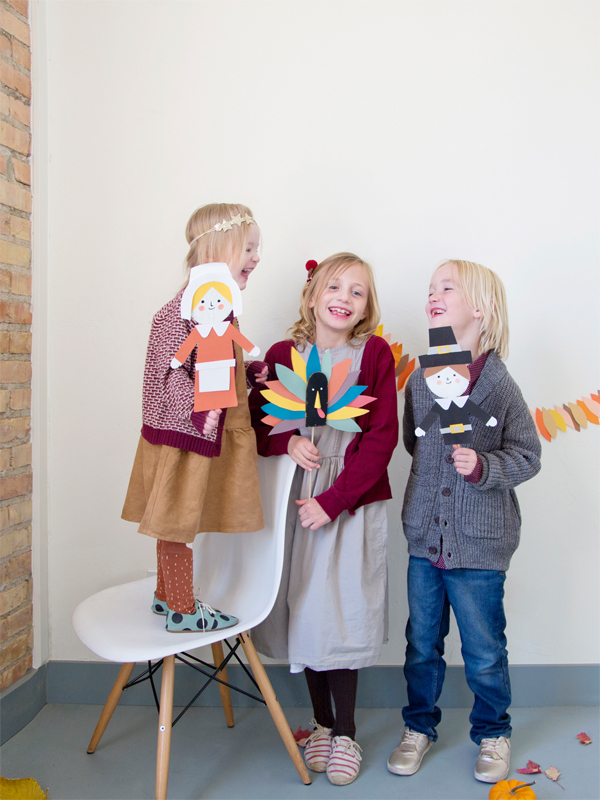 Step 10: Your turkey puppet is now ready to play with! This post is sponsored by Lifetime. 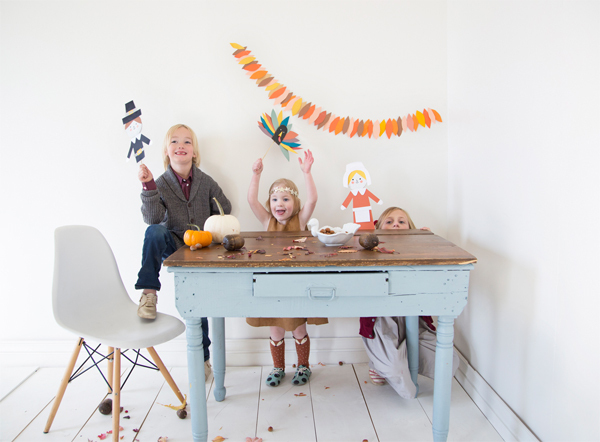 It’s a lovely idea and after crafting little ones can make a puppet theater to entertain guests. My boys love to make special shows for us. Have a nice week-end ! These putppets are really cute! I’ve been wanting to do something like this with my little man! I guess this is the week to do it! 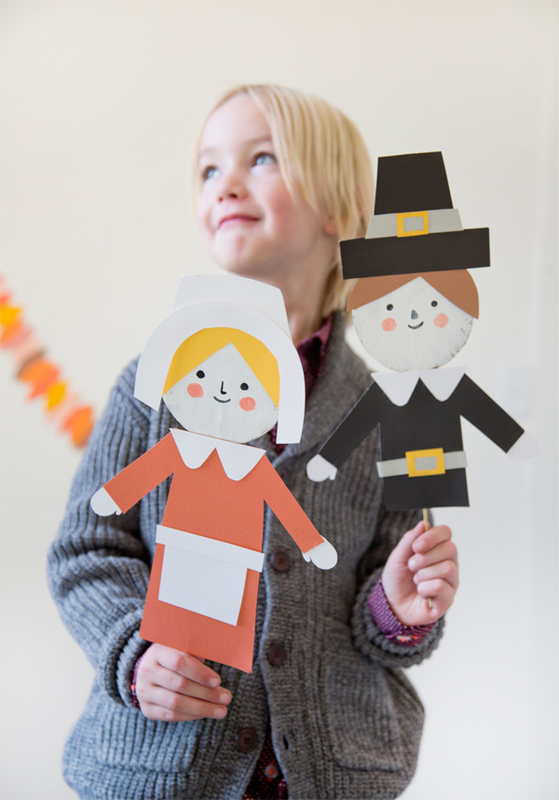 I love the idea of Thanksgiving puppets, the children must have had such fun with these! How incredibly cute are these! So lovely! 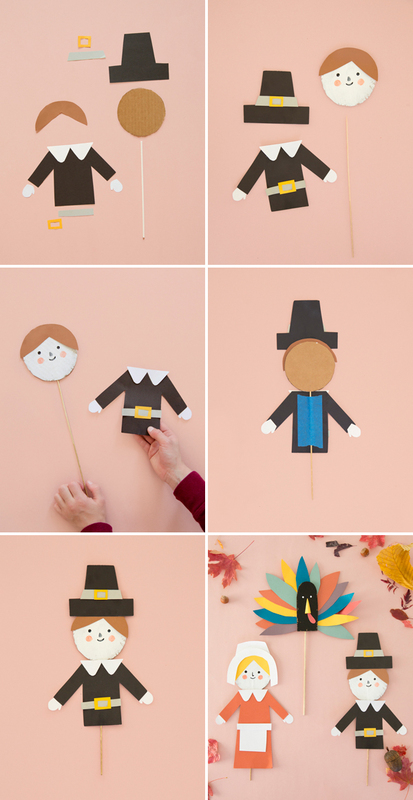 Those are so cute for a Thanksgiving with kids! I love them, such a wonderful idea!